Metal detecting and fieldwalking here in 1991 and 2012 recovered a medieval coin, buckles, and a strap-end along with sherds of medieval and post medieval pottery. June 1991. Two areas of metal detecting and fieldwalking, west area is Context 2, eastern area Context 1. Medieval metalwork, medieval and post medieval sherds. 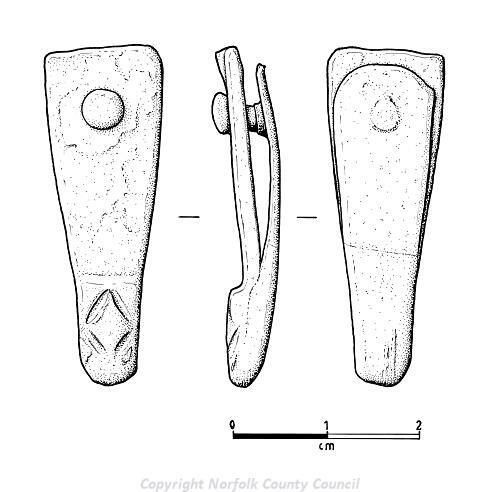 One 11th or 12th century strap-end (S1 and S2) and a medieval buckle. A. Rogerson (HES), 03 September 2012. <S1> Illustration: Gibbons, J.. 2012. Drawing of a medieval gilt copper alloy one-piece strap-end.. Film. 2:1.